Winner of the Best Carbon Footprint Award 2011! 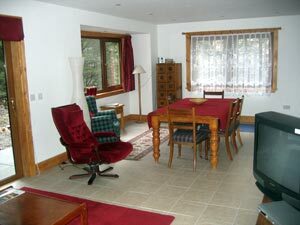 - one of only two B&Bs in Scotland! 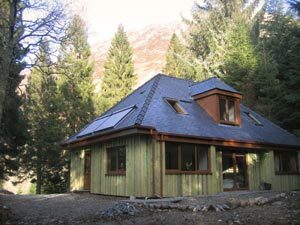 With wonderful mountain views and tucked in amongst ancient trees in this secluded part of the most famous of the Scottish Glens, Signal Rock Cottage was built to the very highest Green standards and finished in January 2008. 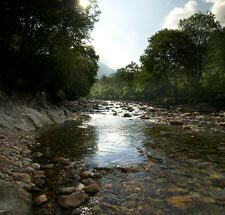 The cottage is surrounded by 50 acres of mixed woodlands on the banks of the River Coe abundant with birds, butterflies, and deer. You can wander through the woods to the iconic Signal Rock from which the Macdonald Clan warned the inhabitants of the Glen of danger. Legend also has it that the Rock was used by the Druids for worship hence its Gaelic name Rock of the Sun. Torren Loch, a view from the drive towards the cottage. Glencoe is one of the most inspiring landscapes in Scotland, offering all kinds of outdoor activities from professional rock and ice-climbing to gentler family walks, from fishing in loch and river, to exploring wild life and geology, all of which are within walking distance. The Glencoe River, 100m from the cottage. Available for bed and breakfast (or self-catering rental only at Christmas and new Year) Signal Rock Cottage has 2 double bedrooms, each with their own shower-rooms en-suite. There is a sitting/dining area especially for guests with patio doors leading out to a small paved area, and a kitchen with all facilities. 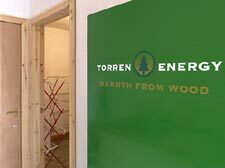 Owner Viki Sutherland put in under floor heating fired by an eco-friendly woodchip boiler and installed en-suite wet-room showers. Well-being of guests was top of the list when designing the house! Goose-down pillows and duvets and 100% cotton sheets on all beds as well as large fluffy bath towels add to your comfort. Trout fishing on the Sutherland's own loch is just 2 minutes walk from the Cottage.The cottage is a 15 minute walk to the Clachaig Inn which serves a large selection of real ale, good food and live music at week-ends - a well-known pub for walkers and climbers. 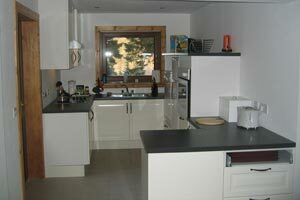 Bedrooms, shower-rooms, living room and kitchen are on the ground floor. The house-keepers Louiza, Lippa and Swaek live on the top floor and have their own separate entrance, and make you breakfast if you are staying for B&B, and are very helpful and friendly! and both with views of the mountains! Shower-rooms are wet-rooms with underfloor heating and warm all the year round. Free Wi-Fi Broadband internet access throughout. Orange Juice, Grapefruit, Fruit Yogurt, Porridge, Muesli, Various cereals, Fresh fruit, Eggs, fried, scrambled, poached or boiled, Bacon, Sausages, Tomatoes, Brown toast, White toast, Croissants, Marmalade, Scottish Heather Honey, Tea and Coffee. 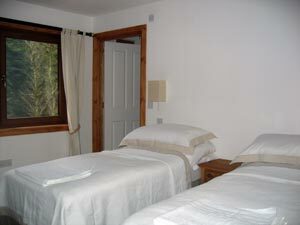 There's also BBQ equipment, and washing/drying facilities in a laundery area shared with Glencoe Cottages. Photographs on this page (except for Glencoe River) courtesy of Viki Sutherland. Single night bookings will not be taken at week-ends. 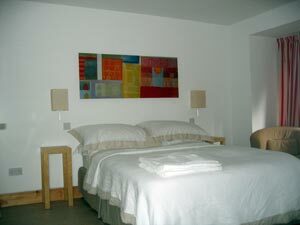 Holiday week-ends require a 3 night booking. For the Christmas week and New Year week. Prices on application. "Top Performing Green Guesthouse in UK & Ireland 2010-2011"
Please read the Conditions of Hire before booking. Sorry, your browser does not support 'iframes'. Please say you found Signal Rock Cottage through About Scotland! Right; Heating for the cottage is provided by a central boiler run on a sustainable and renewable source; forestry woodchips. Next to it is a drying room for guests. 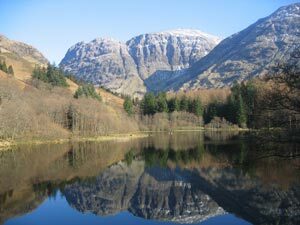 Glencoe is the perfect place from which to explore Scotland, being only 85 miles from Glasgow, 2 1/2 hours by car and with excellent rail-links from the south by the West Highland line to Fort William which is only 16 miles away. Oban is 35 miles, Stirling and Inverness 80 miles. Climb Ben Nevis - visit Skye - sail to Iona or Mull or explore the quiet corners of Scotland at your leisure.